An infographic from safety and security solutions company NC4 shows how cyberthreats will continue to evolve beyond 2017, including the rise of healthcare as a target, spending and cost trends, and a decrease in cybersecurity pros’ confidence that their risk assessment capabilities are adequate. According to a recent study by IBM Security, 70% of businesses infected with ransomware have paid ransom to regain access to business data and systems. In comparison, over 50% of consumers surveyed said they would not pay to regain access to personal data or devices aside from financial data. There will often be gaps in your security infrastructure, with vulnerabilities present in credential and other security systems. However, if you’re aware of these gaps, you can take steps to minimize your risk. 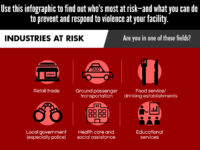 Click here to view the original infographic from Brivo, along with more information on improving your security infrastructure. 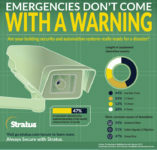 Infographic: Are Your Security Systems Ready for Disaster? Nearly one-half of businesses have had unplanned downtime of their security systems. Take a look at this infographic to see how long these unplanned downtime events last and their most common causes. While holiday weekends provide a nice break for millions of employees nationwide, they are prime working hours for cargo thieves. Take a look at these tips for keeping your products and your business secure so that you can rest easy this Labor Day weekend. Read more about the issue at Overdrive.